Abstract: We report on a 72 year-old pseudophakic patient who had been implanted with a monofocal intraocular lens, and who underwent a unilateral Supracor laser-assisted in-situ keratomileusis (LASIK) procedure to correct presbyopia and hyperopia. Uncorrected near visual acuity was improved, but the patient complained of glare, halo, reduced distance vision, and poor night driving vision due to treatment decentration. One year following the surgery, a reversal procedure was conducted with a wavefront-guided aspheric treatment to reverse the presbyopic correction while still maintaining the hyperopic correction. This resulted in 20/25 uncorrected distance visual acuity, and it eliminated the dysphotopsia symptoms. We believe that this is the first reported case demonstrating the ability to reverse the Supracor LASIK presbyopic procedure using wavefront-guided treatment in a case of an unsatisfactory outcome. Ophthalmologists currently have strategies available to treat presbyopic patients, including lens-based solutions,1,2 corneal inlays,3,4 and laser-assisted in-situ keratomileusis (LASIK)-based treatments.1,5–7 With growing patient expectations, safe and effective outcomes are paramount, and we should be able to correct or reverse the outcomes of an initial procedure when the patient is dissatisfied. In comparison with intraocular procedures, Supracor is less invasive than refractive lens exchange and carries less risk of retinal detachment. In comparison with corneal inlays, Supracor can correct refractive error and presbyopia in a single-step procedure, there is no foreign body implanted into the cornea which may cause a reaction in the future and there is no learning curve in terms of surgical technique. A 72 year-old male patient underwent phacoemulsification with implantation of a monofocal intraocular lens (IOL; SN60AT, Alcon Laboratories, Inc., Fort Worth, TX, USA) in December 2006. The lens was in-the-bag and in a planar position with no visible tilt or decentration. A YAG capsulotomy had been performed so there was no capsular opacity centrally. In June 2011, the patient enrolled in a prospective study to evaluate a new presbyopic LASIK algorithm (Supracor) in pseudophakic patients. The Asian Eye Institute Ethics Committee approved the study, and the patient provided written informed consent. To check for dominance, we placed lenses in both eyes to correct for refractive error. Then we alternately placed a +0.75 D lens in each eye. The eye with the add lens in place for which the patient reported more discomfort was determined to be the dominant eye. We obtained patient feedback by interview. During screening, the uncorrected distance visual acuity (UDVA) in the right eye was 20/25, uncorrected intermediate visual acuity (UIVA) was 20/50, and uncorrected near visual acuity (UNVA) was J8. In the left eye, UDVA was 20/40, UIVA was 20/50, and UNVA was J10. UDVA was measured at 6 meters, UIVA at 67 cm, and UNVA at 40 cm. Manifest refraction was +0.25 −0.75×30 for the right eye, and +0.75 −0.50×140 for the left eye. For both eyes, monocular best-corrected distance visual acuity (BCDVA) was 20/20, and monocular distance corrected near visual acuity (DCNVA) was J8. Ocular dominance test revealed the left eye to be the non-dominant eye. A blur test was performed on this patient with a target using a −0.75 diopters (D) trial lens to simulate a mild monovision effect. Based on patient feedback, it was determined that the patient could tolerate monovision. The patient felt more comfortable with simulated near vision in the left eye. Preoperative central corneal thickness was 615 μm, with the thinnest point being 605 μm. 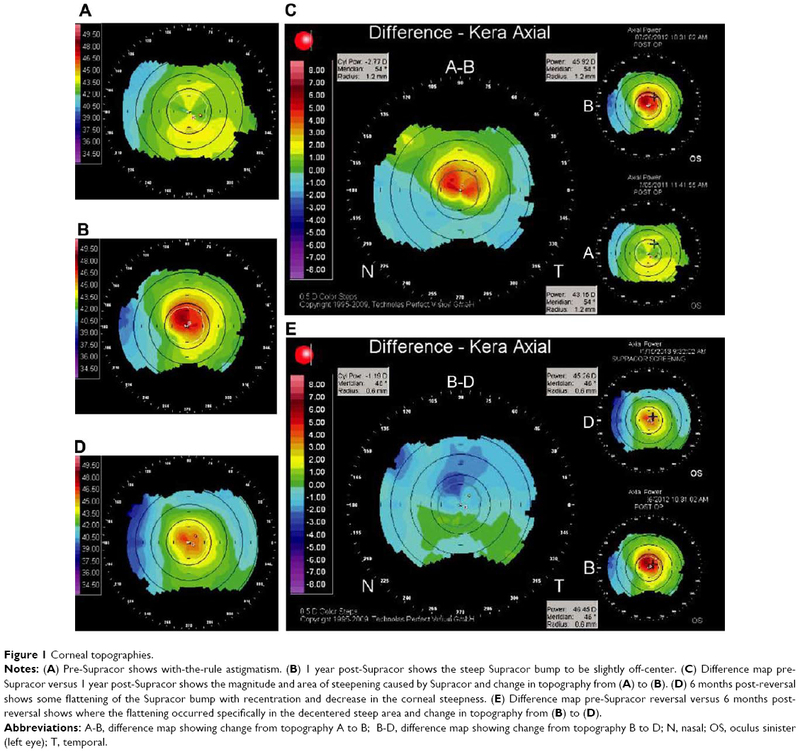 Aberrometry and corneal topography were also performed as noted in Figure 1A and Table 1. Notes: (A) Pre-Supracor shows with-the-rule astigmatism. (B) 1 year post-Supracor shows the steep Supracor bump to be slightly off-center. (C) Difference map pre-Supracor versus 1 year post-Supracor shows the magnitude and area of steepening caused by Supracor and change in topography from (A) to (B). (D) 6 months post-reversal shows some flattening of the Supracor bump with recentration and decrease in the corneal steepness. (E) difference map pre-Supracor reversal versus 6 months post-reversal shows where the flattening occurred specifically in the decentered steep area and change in topography from (B) to (D). Abbreviations: A-B, difference map showing change from topography A to B; B-D, difference map showing change from topography B to D; N, nasal; OS, oculus sinister (left eye); T, temporal. Abbreviations: HO, higher order aberrations; Sph Aber, spherical aberration; yr, year; m, months. Supracor LASIK treatment was performed on the patient’s left eye in July 2011. A 120 μm flap, diameter 8.5 mm, with a superior hinge was created using an XP microkeratome (Bausch & Lomb Incorporated). The laser input of +0.70 −0.50×140 was based on the current Supracor nomogram, and the treatment was centered as close to the corneal light reflex as possible. The optical zone for Supracor treatment was 6.0 mm. The hyperprolate zone was 3.0 mm. The ablation depth of the full Supracor treatment was 19 μm. One day postoperatively, UDVA was 20/80, UIVA was 20/50, and UNVA was J2, with a manifest refraction of −1.50 −1.25×40. BCDVA was 20/25 and DCNVA was J3. The patient was unsatisfied with distance vision, but noticed some improvement in near vision. He later complained of progressive doubling of vision and overall discomfort because he felt that both his far and near vision were poor in the operated eye. The patient also reported severe glare and halos that were starting to affect driving at night. One year after LASIK, we decided on an excimer laser-based retreatment to remedy the situation because the cause of failure was determined to be decentered ablation with induction of myopia and astigmatism. A lens-based approach was not applicable for this condition. We discussed surgical reversal of the presbyopic treatment with the patient. He requested to have good distance vision and indicated he would be happy wearing reading glasses just as he did before the Supracor treatment. In July 2012, prior to reversal, the left eye had a UDVA of 20/100, UIVA of 20/50 and UNVA of J1 with manifest refraction of −1.25 −1.50×55. The BCDVA was 20/30 and the DCNVA was J3. Pre-reversal central corneal thickness was 614 μm with the thinnest value being 606 μm. The time between the Supracor treatment and the reversal procedure was 12 months. During this time, we observed stable refraction and topography. We initiated dry eye therapy such as artificial tears, cyclosporine eye drops, and placed a punctal plug. The poor vision persisted despite dry eye treatment. To reverse the Supracor effect, a wavefront-guided aspheric treatment (Zyoptix Personalized Aspheric Treatment, Bausch & Lomb Incorporated) was performed on the patient’s left eye in August 2012. The aberrometer measured higher order aberrations at a pupil size of 6.0 mm. Laser input was −0.75 −1.42×38 using the Zyoptix Treatment Calculator (Bausch & Lomb Incorporated). We lifted the previous flap, and the treatment was performed. We used an optical zone diameter of 6.0 mm centered on pupil center. The ablation depth of the wavefront-guided reversal treatment was 57 μm. The following day, the patient noticed improved distance vision. UDVA was 20/25, UIVA was 20/40, and UNVA was J10, with a manifest refraction of plano −0.50×50. BCDVA was 20/25 and DCNVA was J8. At 6 months post-Supracor reversal, UDVA was 20/25, UIVA was 20/30, and UNVA was J5, with a manifest refraction of plano −0.50×65. One year post-reversal, UDVA was 20/20, UIVA was 20/40 and UNVA was J8 with manifest refraction of +0.00 −1.00×40. Table 2 summarizes the visual and refractive outcomes from pre-Supracor screening to 1 year post-Supracor reversal. Abbreviations: MR, manifest refraction; BDVA, best distance visual acquity; UDVA, uncorrected distance visual acquity; UIVA, uncorrected intermediate visual acuity; UNVA, uncorrected near visual acuity; DCNVA, distance corrected near visual acuity; yr, year; m, months. The pre-Supracor map (Orbscan, Bausch & Lomb Incorporated) showed with-the-rule astigmatism (Figure 1A). One year post-Supracor, we observed marked steepening which looked decentered superiorly (Figure 1B). The difference map between the pre-Supracor and the 1 year post-Supracor (which is also the pre-Supracor reversal screening) topographies showed off-center superior steepening with significant astigmatism (Figure 1C). Topography 6 months after reversal showed recentration and a decrease in corneal steepness and astigmatism (Figure 1D). Since we reversed only the Supracor overlay and not the basic hyperopic and astigmatic correction, some residual steepness remained. The difference map between the pre-Supracor reversal and post-Supracor reversal topographies shows that the areas of greatest steepening were selectively flattened by the wavefront-guided aspheric treatment (Figure 1E). Examination of the wavefront aberrometry readings taken by the Zywave Aberrometer (Bausch & Lomb Incorporated) shows an increase in magnitude of vertical trefoil, vertical coma and horizontal trefoil, decrease in magnitude of spherical aberration, and minimal change in horizontal coma and total higher-order aberrations between the pre-Supracor and post-Supracor periods. Following reversal using wavefront-guided aspheric treatment, vertical coma, horizontal coma, horizontal trefoil, and total higher-order aberrations decreased, while there was minimal change in vertical trefoil and spherical aberration (Table 1). The different approaches to presbyopic LASIK algorithms are designed to create multifocal ablations on the cornea. Supracor and PresbyMAX (Schwind Eye-Tech-Solutions GmbH & Co. KG, Kleinostheim, Germany) use the center for near/periphery for distance vision principle, while the pseudo-accommodative cornea (PAC; NIDEK CO. LTD., Gamagori, Aichi, Japan) uses the opposite principle.6,10–12 The common objective is to create a cornea which allows the eye to have good distance and near vision simultaneously. The Supracor algorithm creates a varifocal treatment defined as a system that provides a smooth transition from distance correction to near correction, eliminating segment lines and allowing the viewing of all intermediate vision distances. Supracor creates a near addition zone 3 mm wide, with approximately 12 μm maximum elevation, surrounded by an aspheric-optimized mid-peripheral zone. The Supracor LASIK procedure aims to improve near and intermediate vision while maintaining or improving distance vision because it corrects refractive error and presbyopia in a single procedure. The ideal refractive target is a −0.50 D spherical equivalent, which gives a simultaneous vision of 20/25 for distance and J2 for near vision. This case was unique because the presbyopic LASIK procedure was performed on a pseudophakic patient in whom no residual natural accommodation was present. Therefore vision, refraction, and wavefront changes were fully attributable to the corneal treatment. This report is significant because it shows that a reversal of a multifocal corneal treatment is possible. The Supracor treatment aimed to correct the patient’s hyperopic refractive error and simultaneously perform a presbyopic treatment. We believe that this patient did not attain the desired Supracor result due to treatment decentration. The decentered steepening on topography and induction of third order aberrations, such as vertical coma, vertical trefoil, and horizontal trefoil, support this hypothesis. In addition, there was an overcorrection which resulted in myopic astigmatism. As a result, the patient suffered from poor UDVA, loss of BCDVA and visual phenomena such as glare and halos which affected his night-time driving. The goal of the retreatment was to remove the dysphotopsia and improve the patient’s distance vision. To reverse the Supracor procedure, we decided to use a wavefront-guided aspheric treatment to remove the decentration, reduce the unwanted higher-order aberrations, remedy the myopic astigmatism, and remove the Supracor effect, but at the same time retain the hyperopic LASIK treatment to improve distance vision. We believe that our reversal was effective because we achieved our goals of removing the decentration by selectively flattening the steepest areas on topography, lowering the unwanted aberrations, and correcting the myopic astigmatism simultaneously. The patient continues to enjoy good vision without the unwanted glare and halos and he is now able to drive without problems. His distance vision improved because we corrected his refractive error. He uses reading glasses again because, as we discussed with him, reversing the Supracor effect meant returning him to a presbyopic state. The topography still shows some central steepening compared with the preoperative map because the wavefront-guided reversal removed the Supracor treatment but retained topography similar to a hyperopic LASIK procedure (ie, after the reversal the residual topography was similar to a typical topography of a hyperopic treatment). The hyperopic LASIK treatment was the non-presbyopic part of the treatment to improve his distance vision. Luger et al described a non-wavefront-guided presbyopic reversal in a patient intolerant of multifocality after PresbyMAX treatment.13 In our case, we had to remedy a decentered treatment which was causing dysphotopsias, so we felt a wavefront-guided retreatment was a better approach. Wavefront-guided aspheric treatment (Zyoptix Personalized Aspheric Treament, Bausch & Lomb Incorporated) is a combined treatment algorithm whereby an ablation profile is created to correct measured aberrations of the ocular wavefront seen preoperatively. Then, an additional component is added to this ablation profile which aims to compensate for the surgically induced spherical aberration. A topography-guided software package was not available for us at that time, so it was not considered an alternative. The difference map showed where the Zyoptix algorithm treatment resolved the decentered steepening caused by the original treatment. Even if we had used wavefront-guided treatment, we would not have been able to return the corneal and ocular aberrations to pre-presbyopic treatment levels nor could we make the aberrations the same for both eyes. Remedial measures such as wavefront-guided or topography-guided treatments seek to minimize unwanted aberrations to low enough levels to restore good uncorrected distance vision and regain lost lines of distance corrected vision. In this case, we were able to reduce the dysphotopsias, but we also lost the localized steepening of the Supracor presbyopic treatment. To our knowledge, this is the first reported case of wavefront-guided reversal of presbyopia treatment. This report is important because it opens the possibility of other surgeons performing future enhancements or reversals. If succeeding surgeons can show that we can consistently reverse a multifocal corneal procedure, then the adoption of presbyopic LASIK technology would be faster and more widespread. However, the choice of wavefront-guided or topography-guided treatments in complicated cases like this will be the subject of future discussion as more experience is shared. In the meantime, it is reassuring for users of Supracor or any other presbyopic LASIK treatment that in cases of less than ideal outcomes, the treatment can be reversed with good results. Dr Ang is a consultant for Bausch & Lomb Incorporated. The authors have no other conflicts of interest to disclose. Barisić A, Gabrić N, Dekaris I, Romac I, Bohac M, Jurić B. Comparison of different presbyopia treatments: refractive lens exchange with multifocal intraocular lens implantation versus LASIK monovision. Coll Antropol. 2010;34 Suppl 2:95–98. Cochener B, Lafuma A, Khoshnood B, Courouve L, Berdeaux G. Comparison of outcomes with multifocal intraocular lenses: a meta-analysis. Clin Ophthalmol. 2011;5:45–56. Dexl AK, Seyeddain O, Riha W, et al. One-year visual outcomes and patient satisfaction after surgical correction of presbyopia with an intracorneal inlay of a new design. J Cataract Refract Surg. 2012;38(2): 262–269. Yilmaz OF, Alagöz N, Pekel G, et al. Intracorneal inlay to correct presbyopia: long-term results. J Cataract Refract Surg. 2011;37(7): 1275–1281. Alarcón A, Anera RG, Villa C, Jiménez del Barco L, Gutierrez R. Visual quality after monovision correction by laser in situ keratomileusis in presbyopic patients. J Cataract Refract Surg. 2011;37(9):1629–1635. Uthoff D, Pölzl M, Hepper D, Holland D. A new method of cornea modulation with excimer laser for simultaneous correction of presbyopia and ametropia. Graefes Arch Clin Exp Ophthalmol. 2012;250(11): 1649–1661. Jung SW, Kim MJ, Park SH, Joo CK. Multifocal corneal ablation for hyperopic presbyopes. J Refract Surg. 2008;24(9):903–910. Papadopoulos PA, Papadopoulos AP. Current management of presbyopia. Middle East Afr J Ophthalmol. 2014;21(1):10–17. Torricelli AA, Junior JB, Santhiago MR, Bechara SJ. Surgical management of presbyopia. Clin Ophthalmol. 2012;6:1459–1466. Uy E, Go R. Pseudoaccommodative cornea treatment using the NIDEK EC-5000 CXIII excimer laser in myopic and hyperopic presbyopes. J Refract Surg. 2009;25(1 Suppl):S148–S155. Pietrini D. Multicentre clinical evaluation into a new excimer algorithm for presbyopia. Free Paper presented at: the European Society of Cataract and Refractive Surgeons Annual meeting; September 17–21, 2011 Vienna. Chaubard J, Castanera J, Roure A, Barragan E. Longer-term follow-up on Supracor LASIK algorithm in presbyopic hyperopes. Free Paper presented at: the European Society of Cataract and Refractive Surgeons Annual meeting; September 8–12, 2012; Milan. Luger MH, Ewering T, Arba-Mosquera S. Nonwavefront-guided presby reversal treatment targeting a monofocal cornea after bi-aspheric ablation profile in a patient intolerant to multifocality. J Refract Surg. 2014; 30(3):214–216.